With support from a $4 million National Institutes of Health (NIH) award, researchers from the University of California, Berkeley, and three partner institutions are establishing a new program to train and educate researchers, educators and professionals who can tackle global health challenges specific to slum dwellings. Joining UC Berkeley are researchers from Florida International University, Stanford University and Yale University. The UC Berkeley-led program is one of five consortia announced today (Wednesday, April 4) by the Fogarty International Center, the international arm of the NIH. Each consortium will receive $4 million over five years, for a total of $20 million awarded by the NIH to train a new generation of global health researchers. The UC Berkeley consortium will train early-career health and medical researchers through year-long fellowships based in 10 locations throughout Central and South America, Sub-Saharan Africa, Asia and Eastern Europe. 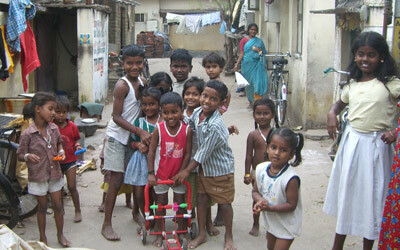 The sites are slum communities where research has been ongoing for at least three years. A second consortium is led by the UC Global Health Institute, which brings together UC San Francisco, UC Davis, UCLA and UC San Diego. The Fogarty awards will fund dozens of research fellowships in a broad array of fields. “In combining the enthusiasm of today’s young scientists with the knowledge and wisdom of America’s global health leaders, we are forming a powerful network to produce a new generation of stellar researchers capable of working in the global arena,” said Dr. Roger I. Glass, Fogarty’s director, in a press statement.